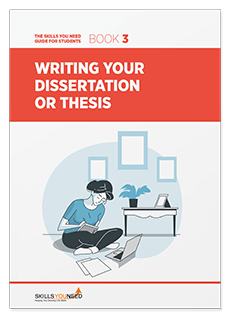 Once you have completed the main body of your dissertation or thesis, you then need to worry about drawing your conclusions, and the additional pages, such as whether to include a table of contents. Your university may have guidelines but, otherwise, you will have to use your own judgement. This page gives some advice about what is often included and why. You may have been permitted, and have chosen, to include your conclusions in the discussion section, see our page on Results and Discussion for some ideas about why you might choose to do this. However, it is normal practice to include a short section at the end of your dissertation that draws out your conclusions. A final paragraph rounding off your dissertation or thesis. Your conclusion does not need to be very long; no more than five pages is usually sufficient, although detailed recommendations for practice may require more space. Your university will almost certainly have formal guidelines on the format for the title page, which may need to be submitted separately for blind marking purposes. As a general rule, the title page should contain the title of the thesis or dissertation, your name, your course, your supervisor and the date of submission or completion. This is a one page summary of your dissertation or thesis, effectively an executive summary. Not every university requires a formal abstract, especially for undergraduate or master's theses, so check carefully. If one is required, it may be either structured or unstructured. A structured abstract has subheadings, which should follow the same format as your dissertation itself (usually Literature, Methods, Results and Discussion). There will probably also be a word limit for the abstract. If an abstract is required, it may be published separately from your thesis, as a way of indexing it. It will therefore be assessed both as a part of your thesis, and as a stand-alone document that will tell other researchers whether your dissertation will be useful in their studies. It is generally best to write the abstract last, when you are sure of the thread of your argument, and the most important areas to highlight. You should include a table of contents, which should include all headings and subheadings. It is probably best to use the standard software tools to create and update this automatically, as it leads to fewer problems later on. If you’re not sure how to do this, use the Help function in the software, or Google it. The time spent learning how to do it accurately will be more than saved later on when you don’t have to update it manually. You only really need to include this if you have a lot of figures. As with your table of contents, it’s best to use the tools available in the software to create this, so that it will update automatically even if you move a table or figure later. This section is used to ensure that you do not inadvertently fall foul of any ‘taking help’ guidance. Anyone to whom you are particularly grateful, like your spouse or family for tolerating your absence from family occasions for years during your studies. You should not use appendices as a general ‘dumping ground’ for stuff you found interesting, but couldn’t manage to shoehorn in anywhere else, or which you wanted to include but couldn’t within the word count. Appendices should be used for relevant information only, such as copies of your questionnaires or interview outlines, letters asking people to participate or additional proofs. You can be reasonably confident that nobody will read them in any detail, so don’t bother to use an appendix to explain why your argument is correct. Anything that you want to be read should be included in the main body of your text. Every university’s requirements are slightly different in terms of format, what sections need to be included and so on. Make sure that you check what you have done against your university’s guidelines and that it conforms exactly. If in doubt, check with the administrative staff dealing with submissions or with your supervisor. You really do not want to be penalised for an error of formatting. Make sure that you put your dissertation together in a single document, and read it over as a whole before submitting it. It is also a good idea to get somebody else to proofread your work to check for any mistakes that you may have missed. Collating your dissertation may introduce errors of formatting or style, or you may notice duplication between chapters that you had previously missed. Allow sufficient time for collating and final checks, and also for any formal binding required by the university, to avoid any last minute panics.